The month of July marks the end of the seventh month of breeding at Living Gems. It was a month of light activity…but good signs for babies. As of today, I am upgrading another three females to gravid (total six), and one to potentially gravid (total one), out of our eleven females total. Note I have arranged the females below by projected due date. In Group 4, our high orange pairing, Nephrite continues to bask away on the warm end of her hide, and also to pass on frozen food. She has gained a whopping 250 grams over her long-term average, and is looking huuuuge. 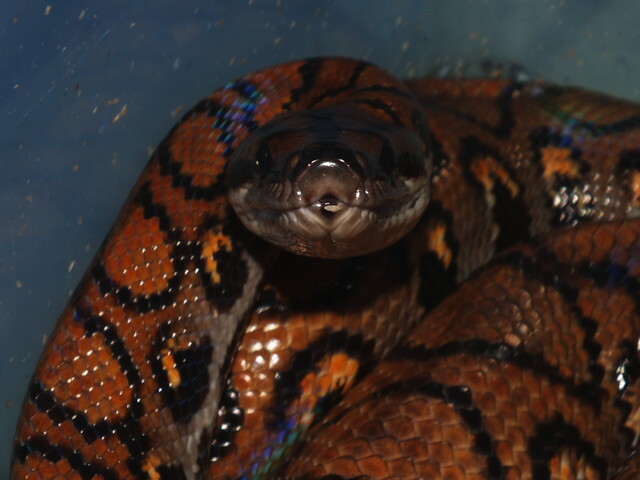 Her behavior this month has confirmed her gravid status, and based on her last shed of April 30 I am assigning a tentative due date of August 28. In Group 8, our orange/red pairing, Malachite has finally begun to bask in earnest, moving from her hide to lie directly on the heat. She even refused a test live mouse. Her weight is still not increasing, which worries me a bit as her last shed was April 9 – maybe I mis-recorded a shed as being the male’s? Her behavior this month, however, still warrants an upgrade to gravid status, with date uncertain (last shed implies August 7, but that seems too soon, and last time she went a whopping 136 days before delivery). In Group 9, our mystery mash-up pairing, Jasper continues to bask away in the center of her enclosure, and also to pass on frozen food. She even refused a test live mouse. Her weight is still not increasing, but her last shed was June 4, so she is still early in the process. Her behavior this month has confirmed her gravid status, and based on her last shed I am assigning a tentative due date of October 2. In Group 1, our hypo to het hypo pairing, Amber has increased her basking, even pushing her hide away from the wall to create more basking space, and continues to pass on frozen food. Her weight is still not increasing, but her last shed was June 10, so she is still early in the process. Her behavior this month warrants an upgrade to gravid status, and based on her last shed I am assigning a tentative due date of October 8. In Group 2, our mixed orange with thick borders pairing, Jadeite continues to bask away in the center of her enclosure, and also to pass on frozen food. Her weight picked up a bit last month, but only rose to her long-term average. 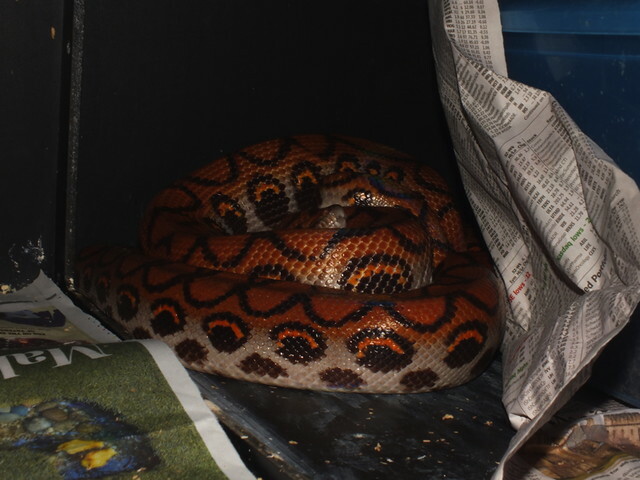 However, her last shed was June 12, so she is still early in the process. Her behavior this month has confirmed her gravid status, and based on her last shed I am assigning a tentative due date of October 10. In Group 6, our mixed orange trio, Aventurine has finally begun to bask in earnest, and continues to pass on frozen food. Her weight is still not increasing, but her last shed was June 15, so she is still early in the process. Her behavior this month warrants an upgrade to gravid status, and based on her last shed I am assigning a tentative due date of October 13. 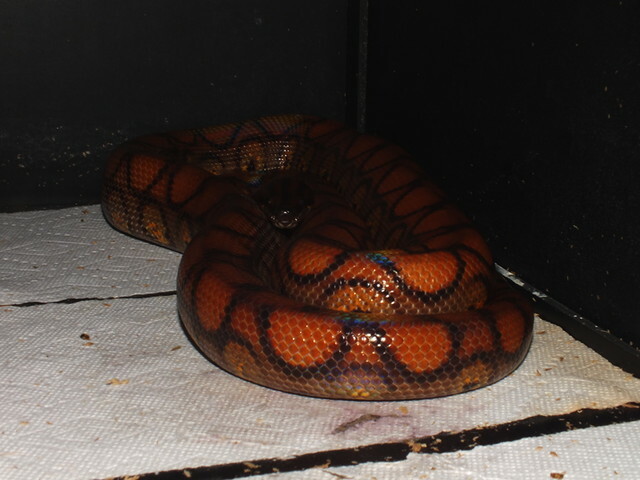 In Group 5, our dark red trio, Uvarovite is giving me pause: her last shed was in May, an unusually long stretch. However, all other signs are absent, so she may just be taking her time between sheds. I am moving her to potentially gravid, but am also not pulling the male yet. Hopefully at least one of the five girls will join the gravid group for a seventh litter. As always, you may feel free to contact me at any time with questions or concerns. Thanks for sharing. As always, love the names ! Thank you, Ruan, for being a regular reader! And we like the names too!